There is no greater occasion that will get people excited about photography than having a baby. Of course … only with the first baby! Mums often joke that they have a million photos of their first baby, quite a few of the second but by the third, they are lucky to get a look in at Christmas and birthdays! There are a few things that can take your photos from images that are ok for Facebook to worthy of a frame on the wall. If you only learn one thing from this article, make sure it ‘s this one – it is ALL about lighting. The light source you have will make or break your images. Natural light is always best and your photos of your baby will look just magic in the right light. If you position your baby next to a bright window, you can get a studio feel to your image. Just have the light falling on your baby’s face. If you find it is too harsh, string up a sheet of muslin for the light to filter through, light white baby wraps work well. A baby photo can also look just magic when shot outside at the right time of day, usually dusk. But as we all know, kids don’t always want to play nice at the right time of day. If you want to get serious about indoor lighting you can pick up some nice soft box lights quite cheaply here. These will give you a close to natural filtered light. Utilise the available light. Notice in the photo above, the sunset is hitting the baby from behind, giving a beautiful back light and creating a lovely haze. You want to avoid any direct light hitting the baby’s face as this will result on parts of the face becoming over exposed. OK, well sometimes flash, but no flash directed at the baby! Generally speaking, using flash will flatten your image and stun your baby. Unless you have an external flash unit that you can redirect the flash to bounce off another surface, eg. the ceiling creating light that will fall on your baby rather than blast it from the front, don’t use it. If you do have a DSLR with a pop-up flash, I have had some success with this nifty little gadget that redirects your flash. Or sweeps, as fancy pants photographers call them. This may be as simple as a blanket or a pile of white fluffy towels. You want the focus of your photo to be on your baby. Or perhaps your dog and your baby. Have a play with this one and practicese shooting from different angles. 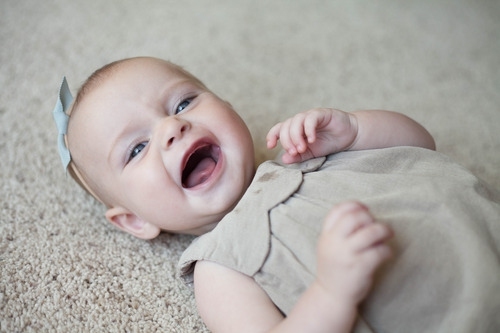 Babies look gorgeous when they look up to the camera, so don’t be afraid to play with different shots. It sounds really obvious but it is such a common mistake for new photographers. If you have a single focus point and it is always the eye, your images will start to look more professional. Get your camera off automatic and watch your photography open up a whole new world of creativity. Once you learn the basics such a depth of field (having the subject, or in this case the baby, in focus and the background blurry) and how to use shutter speed to let more light in, your images will start to sing. Experiment with processing apps, if you plan on taking lots of photos I suggest Lightroom and of course Photoshop. However these are costly and if you want your photos just for social media, I suggest downloading some apps on your phone. Don’t be afraid to play around in the editing suite with a photo that you think is a flop if the composition is good. Try playing with the exposure, adding a filter, cropping it or making it black and white. An ordinary photo can very quickly become extraordinary with a few simple tweeks. Don’t miss precious moments because you are playing with your camera settings. Sometimes, you just need to capture the moment or it’s gone. Sometimes too … it’s better to be in the moment rather than behind a camera! But I often get asked what sort of camera to buy and my recommendation is that if you cannot stretch to a DSLR camera, or if you are not going to take a DSLR off its automatic setting, use an iPhone. While you may not be able to manually control all of the settings on an iPhone in the same way you can on a DSLR, those clever app creators have made all that possible in post processing from your phone. Check out apps such as Snapseed, Afterfocus or King Camera and get the background and vibrancy you want from your iPhone images. These tips are just scratching the surface of the wonderful creative world of photography. As you start taking photos you will discover many more. Photography allows you to capture many of the precious moments and memories that you will have with your child and, I think, a wonderful skill to have in life. There are so many ways to capture an image and the best way to learn is just to start doing. So what are you waiting for?